AEI Arquitectura e Interiores designed the offices for software firm Globant located in Bogotá, Colombia. Globant is a company dedicated to the development of innovative software solutions. It was founded in Argentina in 2003, after its trajectory it has positioned itself as leader of the software sector in Latin America. Currently Globant has 19 development centers in different cities in South America, with approximately 2680 professionals. The corporate spaces of the new Globant offices, located in Bogotá Colombia, represent an innovative design through functional spaces, the architects and designers of AEI Arquitectura and Interiores were inspired by the concept of “travel”, they wanted the experiences that can be generated in a long distance tray: to know other cultures, landscapes and to live unforgettable moments, take this concept of trip as a revitalizer of the mind. 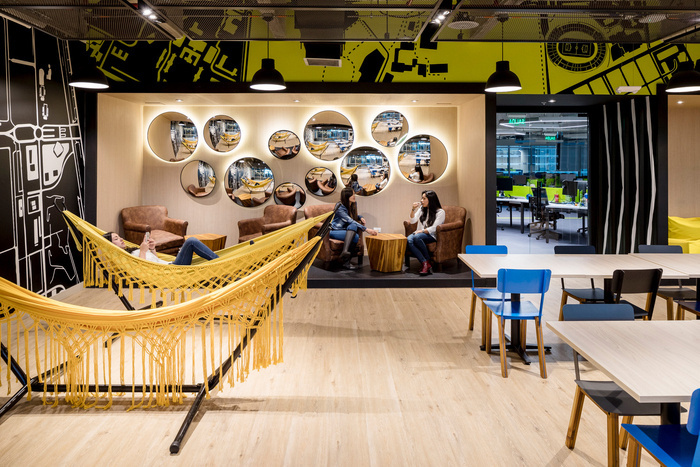 For this company it is very important that its employees feel a sense of well-being and comfort in their work, for that reason they decided to implement concepts related to the company’s philosophy: to interact, to experiment, to travel, to discover, to play, to have a story to tell. Globant considered a typology of axonometry for the job spaces, which incorporates three collaborators per section, incorporating innovative spaces that contribute to the creativity and productivity of the collaborators, 6 containers with capacity for 4 people, were recycled and adapted for a new use, and thus to project its main concept of “trip”, emphasizing in the youth, dynamic and fun. In this project stand out 4 phone rooms and Three Staff Rooms which are transformed into conventional rooms.